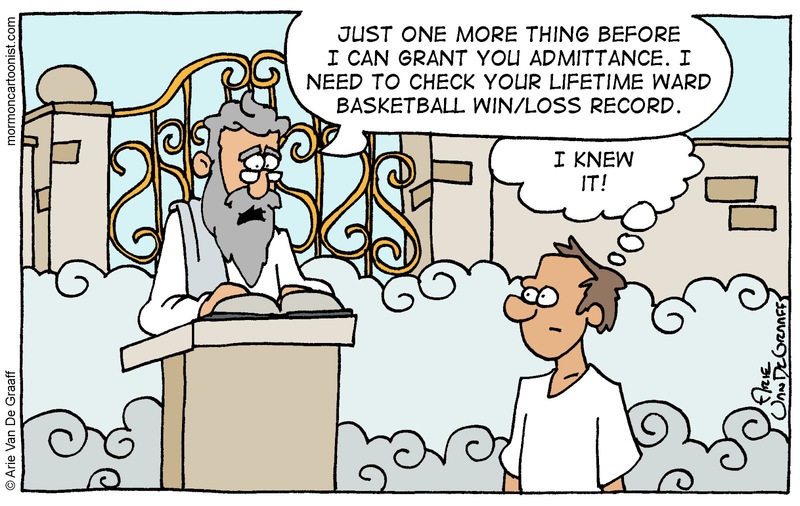 Just think how much more serious some ward basketball players would take ward ball if they only knew that their cumulative win/loss record counted in the final judgement. *Personally, I'm likely slotted for the telestial kingdom (darn 3rd Ward!). I was a member of a 3rd ward. We had no gym at the time. When I became a member of a 2nd ward, we did, and wow, did we take bball seriously. I'm 6'5 now and one guy was about the same height and was probably our most serious player there. If he got the ball, I learned to be careful not to get in his way too much. We even invited nonmembers to join in bball. A few even got baptized. Good times. Eventually that ward became a 1st ward. I'm waiting for the final countdown. Wonder how this one relates to my fave of brother accepting Bishop calling as long as not having to referee ward b-ball. Alt: Just one more thing before I grant you admittance. 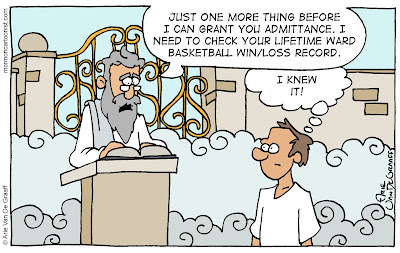 I need to check your lifetime ward basketball personal foul record.